A long weekend coming up? Do you need a place to go? How about being transported to the beach . . . Dancing Dune Grass, an oil pastel (5×7) was meant to do just that. This oil pastel was painted on an ampersand board, starting with an acrylic underpainting and then keeping the scene very simple using mainly Sennelier and Holbein ops – clay shapers came in handy for the thin grass reeds. This entry was posted in About Oil Pastels, OPs New Paintings and tagged art, clouds, dune, dune grass, fine art, ocean, Oil Pastel, painting. Bookmark the permalink. Hi Mary. Love this. How long did it take to paint? Hi Catherine – thanks so much. If you saw my earlier reply that I answered to your question, if you could disregard I answered about the wrong painting – sorry. This painting took a little more than four hours to complete. Thx. I need to muster some courage for oil pastels! The skies are alive and so are the grassy dunes. Beautiful. Thank you Ann-Christine for your thoughtful feedback – I find I’m always drawn to picturesque beach scenes. A really fine piece, Mary! Thanks Elena for your lovely feedback! Have a wonderful weekend. I really like this Mary. I like where you have the horizon line and the point of view of the viewer. Those beautiful clouds and the dune grass make me want to run to the beach. No sharks, I hope. Thanks so much Carol – I positioned the horizon just below the middle, so glad you noticed. Ha, no sharks here but elsewhere along the NC shore a few of the guys are hanging around – no swimming allowed on the beach! Beautiful painting, Mary. Love the rich blue sky and the puffy clouds. Thanks so much Janell for your feedback. The sky was my favorite area to develop on this piece – thanks for mentioning them. Thank you so much Sylvia – that’s exactly the reaction I was hoping for! Love your imagery and vivid comment – I can totally see the scene by the shore. Hope you have enjoyed your mini-vacation! Thank you my friend! Really appreciate your lovely feedback Aquileana ~ sending you back good wishes for a wonderful week. Really nice clouds… and I also like it how the dune grass creeps “up into the sky”. Only a hint of the ocean/lake in the background… just great! Hi Pauline, thanks very much! The thin ocean horizon is what captured my attention, but the clouds are what drove me to paint the scene – the shades of blue and awesome cloud structures are what captivated me. Thank you so much Jo – nothing like a bit of sea breeze and the warm sun as we imagine walking the sandy beach. Seeing that I’m in North Texas, I’ve got to stay with my imagination on this one – makes for a wonderful holiday weekend. Thanks for the well wishes – hope you’ve had a lovely Sunday! Awesome Gallivanta, you make the beach scene real through your comment – thank you! Beautiful painting, Mary. And – yes, you’ve guessed – WP had unfollowed me from you again! Hi Sarah, thank so much!! Amazing that it keeps happening to you ~ sorry about that. Thank you for always coming back – hope you are well on this fine weekend. You capture the movement of the grass really well, and yes it seems like it dancing on the dune. Thank you Evelyne – their caught in the sea breeze! Wow Mary, this is so lovely. Your work just keeps getting better and better…. What a beautiful comment Catherine – thank you so much! It’s a perfect capture in paint! You are so talented! My friend, thank you so much for your lovely compliment. Hope you are enjoying your weekend off. No beach for us this weekend … after all, we are quite inland. 😉 …. I like this one – secluded – away from the throngs – a chance to relax. Perfectly in season and so so beautiful, Mary! Happy 4th of July to you and your family, Mary! Thanks you so much Francesca – so great to see you again. My best to you and Stefano for a wonderful weekend, and happy 4th of July to you as well! Thank you Maniparna for your generous words. Have a lovely weekend. I know your focus was on that sand, but my eyes were drawn straight away to that sea grass…..how magnificently you captured that…….also, the clouds/sky…wow! Hi A! Thanks very much – glad you enjoyed the scene and the dancing sea grass! The sky was great to work out – many layers of a variety of blues. Have a wonderful 4th of July! Wonderful! How cool that you start with acrylic … nice to hear how you do this wonderful artwork. Thanks very much and appreciate your feedback! I think your sand looks very believable, really sandy. Love that you find something you want to learn and then practise til you do. Hi Heidi, thanks so much! 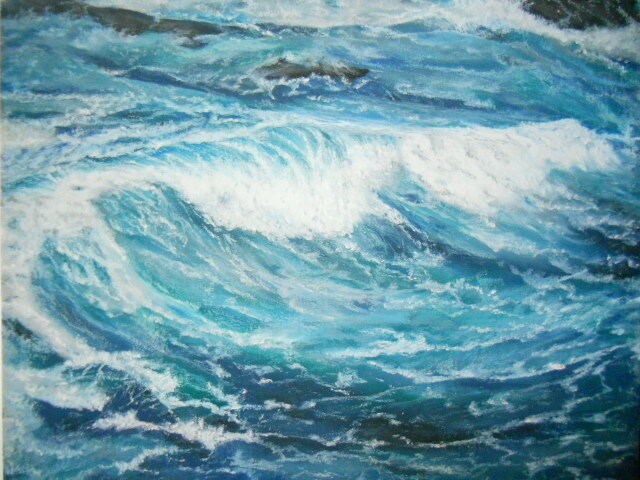 I have a long way to go with sand, using oil pastels – it’s tough to get the right colors w/o making mud. Two or three paintings to go and then I’ll be moving onto a new subject, it’s been a good learning experience. Thanks for your compliment – means a lot. I’m a believer, Mary. I want to walk that sandy beach right now! Reminds me of the Cape even though I haven’t been there since I was a kid. Have a great weekend. Thanks very much Geralyn – I’m thrilled that the painting brought back so many wonderful childhood memories. Have a great weekend too! I would like to join you! Yes! This one makes me yearn for the beach. I love your header too. Thanks Dorann – hope you have a lovely 4th of July!! Hi Laura, thanks very much for your wonderful description. I loved working the sky – the underpainting was ultramarine, but the oil pastels were a combination of cobalt and sapphire blues with a touch of cerulean. Glad you mentioned “warmth of the sun” it is what I was after. Thanks again – have a wonderful weekend. Your blues are playing well together. I’m glad you got what you were after in this. Sometimes it doesn’t matter how much others love a piece if it falls short of our own expectations. You definitely have lots of warmth here. And beauty! I wish you a wonderful, creative weekend! Thank you so much Laura! Ha, I’m working on a scene now (well for the last 5 days – because it’s well short of my https://widgets.wp.com/notifications/1936288681#expectations) don’t know if i will ever come together. We’ll see ~ have a great weekend! You’re quite talented; I have great faith in you, Mary! Very believable, Mary. Reeds and sand dunes. Nice cirrus clouds as well. Thanks so much Tom for your generous comments and feedback on the scene. The sand was mostly applied by using a painters knife of thicker slices of the OPs and thanks for mentioning the clouds, they were my favorite part to develop. Have a wonderful weekend and Happy 4th! Hi Janet, thanks so much ~ glad you enjoyed the warm summer scene! 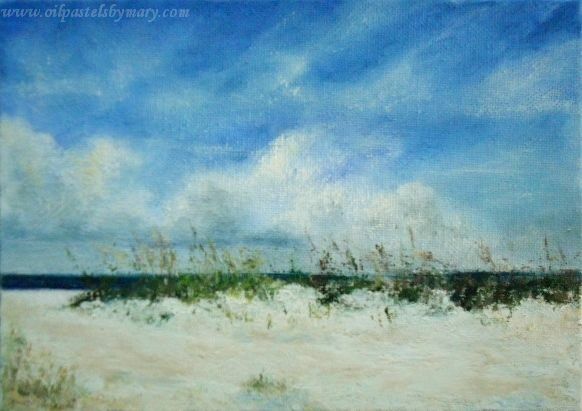 I’ll be a homebody this weekend, Mary, so I appreciate being transported to the beach by your lovely painting! The town, here, does 4th of July Fireworks in the local football field, which happens to be only two streets away from me, so I can stay in my recliner chair and look out my picture window at the display as it explodes over the trees…pretty convenient. I hope you enjoy the holiday, however you choose to observe it! My husband and I are to be homebodies too this weekend with projects around the house. So I guess we are all going to be transported to the beach through the painted scene. Thanks so much – love your feedback. Wow, now don’t you have the best views in town!! Hope they are spectacular with a brilliant and dazzling display of colors/formations. Happy 4th to you and hope you have a wonderful weekend. Thanks so much Rita!! Sand is a complete challenge for me – but one of these days I’m going to feel a lot better about painting it, just not quite there yet. Have a wonderful 4th my friend! !